Under current law, the U.K. is set to leave the EU — with or without a deal — at 11 p.m. London time on March 29. Any delay would need to be accepted by all 27 other member states. Sterling slipped nearly 1 percent to trade at $1.3156 at around 1 p.m. London time. Prime Minister Theresa May returns to Downing Street on March 18, 2019 in London, England. U.K. Prime Minister Theresa May formally requested a short delay to Brexit on Wednesday, 1,000 days after the U.K. narrowly voted to leave the European Union. 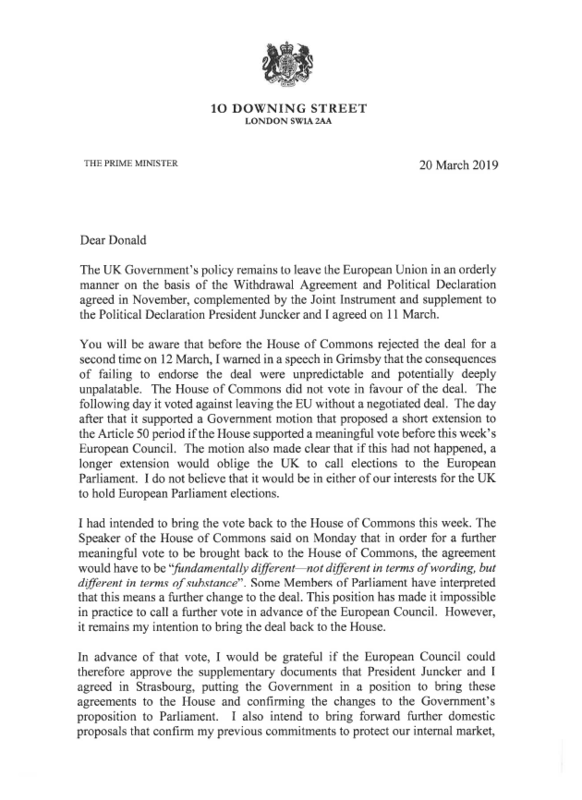 The request, in a letter to EU leaders, seeks to put Britain's departure on hold until June 30. Any delay would need to be accepted by all 27 other member states. May is set to travel to Brussels on Thursday to discuss the options with her counterparts. In a letter addressed to European Council President Donald Tusk, May said she had warned U.K. lawmakers that the consequences of their second rejection of her plan to leave the EU were "unpredictable and potentially deeply unpalatable." The prime minister confirmed she intends to bring her Withdrawal Agreement to the House of Commons for a third time. That's despite a surprise intervention from Commons Speaker John Bercow earlier this week, who had said May's deal would need to be "fundamentally different" in order to hold another vote. Last week, U.K. lawmakers comprehensively rejected May's Withdrawal Agreement by 149 votes. They also voted in favor of ruling out leaving the EU without a deal and supported an extension of Article 50 — the legal mechanism to take the U.K. out of the bloc. EU Brexit negotiator Michel Barnier has previously said the bloc would not grant a delay without a "concrete plan" from Britain about what it planned to do with the extra time. The European Commission opposes extending British membership of the EU to June 30, Reuters reported on Wednesday, citing an official EU document. The executive arm of the EU reportedly said on Wednesday that it would be legally and politically difficult for the U.K. to extend its departure date by three months. In the document seen by Reuters, EU officials were said to be faced with a "binary" choice of a short delay from March 29 to before May 23 or a long delay until at least the end of the year — with Britain obliged to take part in European elections for European Parliament lawmakers on May 23. "I do not believe that it would be in either of our interests for the U.K. to hold European Parliament elections," May said. The prime minster has also ruled out delaying Brexit any further than 30 June.